Fresh sweet plums are a dessert all alone when eaten out of hand, but there are numerous recipes that use these sugary fruits to their best advantage. Guinevere plum fruit is one of the better late season dessert plums. It adapts to baked goods, grilling and even preserves. Growing Guinevere plums will provide you with a heavy crop of huge fruits to enjoy and share. 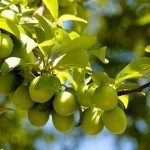 Choosing the right plum tree for your landscape is about more than proper site and growing characteristics. The actual fruit is crucial to the decision of species. The plum ‘Guinevere’ is a fruit you could weep for. It has such intense sweet, nectar-like, juicy flavor that it could easily substitute for a candy craving. Unlike many European plums, Guinevere also stores well in refrigeration. Guinevere is similar to Marjorie’s Seedling but produces more fruit. The trees can get 14 feet (4.5 m.) tall or, if on dwarf rootstock, 8 feet (2.5 m.) in height. This is a self-fruitful tree which originated in Kent, UK. It has only been around since about 2000, but is already regarded as one of the better performing plums. Young trees may bear within two years of installation. After a beautiful spring color display of blooms, the plant begins to produce in in fall. Guinevere plum fruit is quite large and a deep dusky purple-red. The flesh is golden yellow and packs just the right amount of sweetness balanced with a pinch of acid. The plum ‘Guinevere’ requires well-draining soil in full sun. Dig a hole in soil of average pH and fertility that is twice as wide and deep as the roots of the young tree. If the tree is bare root, soak the roots in water for several hours before planting. Also, create a pyramid of soil at the bottom of the hole for the roots to spread over. Balled and burlap plants need to have twine and burlap removed before planting. In all cases, include a tree stake and firm the soil over the roots and water it in well. Spread mulch around the root zone and immediately set protection from deer and rabbits if they live nearby. Plums are quite easy to grow, but it is important to get them off to the right start. Keep young trees moderately moist and prevent weeds from settling in around them. Apply a general fertilizer in early spring. European plums are traditionally pruned to a central leader. Prune the tree to establish a pyramid shape in the dormant season. Leave plenty of space between the lateral stems. Head back any un-branched lateral stems to encourage new growth. Once the tree is trained, the main goals of pruning are removal of dead or diseased wood, crossing branches, water spouts and to keep the plant in a tidy habit and size. 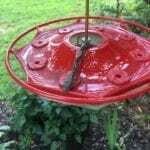 Watch for diseases and pests and treat at the first sign of trouble.